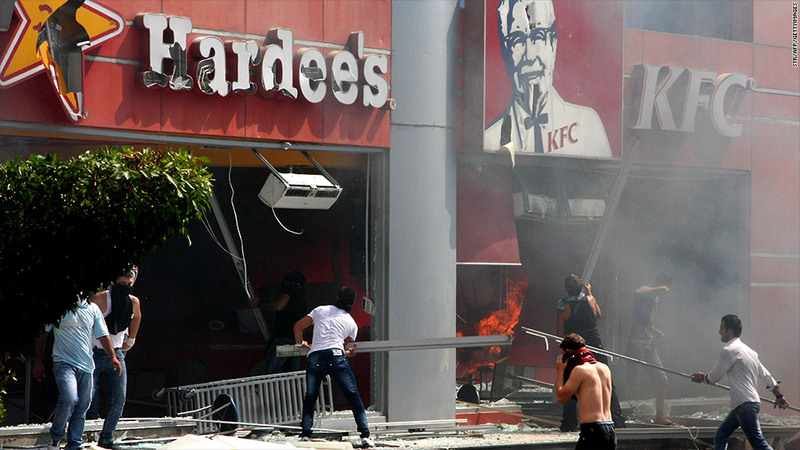 Protesters targeted U.S. franchises in Lebanon on Sept. 14, trashing a KFC, Hardee's and Krispy Kreme. Yum! Brands has closed its KFC restaurants in Pakistan amid violent protests. Yum! Brands is shuttering all of its KFC franchises in Pakistan in the wake of anti-American protests there, after a KFC restaurant was attacked in Lebanon last week, the company said Friday. "Our KFC restaurants in Pakistan are closing as a precautionary measure," said Yum! Brands (YUM) spokesman Christopher Fuller. "They will continually monitor the situation to decide when to re-open." The death toll from Pakistan's violent protests had reached 15 by Friday afternoon. On Sept. 14, protesters enraged by a crudely made anti-Islam video produced in the United States attacked a KFC restaurant and two other U.S. franchises -- a Hardee's and a Krispy Kreme (KKD) -- in Tripoli, Lebanon. "A number of U.S. brand restaurants in Tripoli were damaged, including one KFC," said Fuller. "We have been in touch with our franchisee and fortunately all of our employees and their families are safe." The three franchises were wedged together in a strip mall. Footage of the attack showed open flames pouring from the smashed window of the restaurants. The Hardee's restaurant was also destroyed, but "there was no report of injuries," said Hardee's spokeswoman Julie McLean. "This restaurant was targeted previously, about seven years ago, and we are closely monitoring the situation across the region." Hardee's Arabia, as the company's international division is called, has about 200 restaurants in the Middle East and North Africa, including Jordan, Qatar, Saudi Arabia, United Arab Emirates, Kuwait, Lebanon, Oman and Egypt. A spokeswoman for Hardee's parent company CKE Restaurants said they are monitoring franchises in the region, but that there aren't plans to close any down, aside from the one that was destroyed in Lebanon. The U.S. government closed its embassy in Pakistan on Sept. 17 following an attack against the U.S. Embassy in Libya on the anniversary of the Sept. 11 terrorist attacks. The attackers killed Ambassador Chris Stevens and three of his staffers. The violence has spread from North Africa through parts of the Middle East and Pakistan, where protests have raged for days.